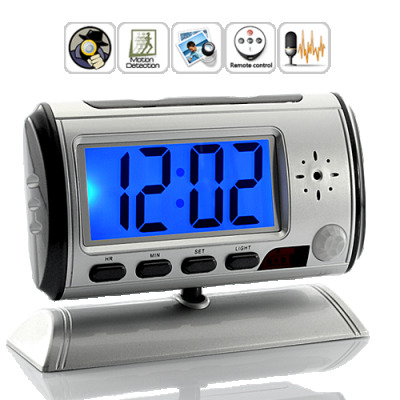 Successfully Added Digital Camera Clock with Hidden LCD Playback Screen and Motion Detection (4GB) to your Shopping Cart. This awesome Digital Camera Clock looks and works just like a normal desk clock, but hidden inside is a virtually undetectable pinhole video lens that lets you covertly take pictures and record video and audio! This Digital Camera Clock records beautiful 640x480 videos directly to a Micro SD card (free 4GB micro SD card included!) at 30FPs for smooth motion capture - and it even records audio! Even better, everything is controlled by a remote control, so you don't have to touch the device at all! Worried about monitoring your home or office? Let the motion-activated hidden camera do the work for you. Battery powered, or plugged in for extended recording, set up the hidden camera sit back. The camera will immediately start taking fast-action surveillance pictures the moment motion is detected so you'll never miss an important event or security breach. When you're ready to review or transfer your footage, simply plug the SD card into your computer. What more? This surveillance recorder is the first clock with playback option! It brings a lot of convenience since there is no more waste of time transferring recorded files to any video player. When you arrive at your place directly watch videos on the screen of this wonderful camera and listen to voices through its clear speaker! You will save precious minutes that might help you catch the thief who has just broken in your apartment.